The broking house I worked for 16 years ago lost their number one rated media analyst. We were in the UK and he had just written a brilliant piece of research on Maxwell Communications. The research lifted the lid on one of the most powerful media moguls in the country and exposed the company for what it was. An opaque listed play thing with corporate governance standards that would curl the toes of the British “establishment” that invested in it. It was bust and our man was pointing at the King with no clothes. It was all good, except for one unfortunate thing. Our man he could not contain his own wit, something rarely encouraged in broking let alone broking research. He titled his note “Can’t Recommend A Purchase” (get it?). Robert Maxwell rang up and insisted he be sacked. He was, even though he was right. Of course Robert Maxwell later fell off the back of his boat and disappeared forever leaving his sons to pick up the flak for a massive misappropriation of funds from within the company. It was an ignominious end for the Maxwells and a development that vindicated our man. But he was not reinstated. It seems being right is just not enough. There is an etiquette in research, unwritten rules that have to be respected, landmines that have to be avoided and the truth is no defence. As the old motorcycle adage goes, “It’s no good being in the right if you’re dead”. Analysts take note. Sell recommendations are more likely to be wrong than right because of the long term upward trend of the market. The price of any company that doesn’t go bust (a tiny minority) is almost certain to one day rise again. 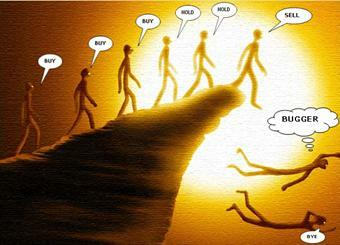 If you advise someone to sell something, especially a big stock, you are bound to look stupid eventually. Just leave it long enough. And as any broker can tell you, clients have tremendous powers of recall when it comes to money they didn’t make. They will remember and blame you decades later. The other blatant fact about sell recommendations from a business point of view is that the audience for a sell recommendation is limited to shareholders. It only appeals to a limited number of people. But the audience for a buy recommendation is the whole world. Which one do you think is going to generate more business. If you put out a sell recommendation you have to ring people who have bought the stock and tell them they were wrong. It’s a hard sell. Especially when they are one of the long term faithful. Not sure they’ll think you’re doing their share price any favours and woe betide you if you’re wrong. Good way for a broker to upset a few clients and do no business. One of the main ones however is this. Companies don’t like it when brokers suggest their painstakingly acquired shareholders sell. It not good for relationships between company and analyst. An analyst’s life blood is the relationships he builds with his researched companies. The access he has to management. Why would he want to screw that up. Even if the analyst doesn’t care writing sell is one sure way for the analyst to screw up the chances of his corporate department ever doing a deal for the company in question. Getting corporate deals hard work, it can take years. Corporate departments are there to support companies and their share prices, not kill them. A sell recommendation from your own analyst is an Exocet missile for any corporate ambition. It is a fact of life. Brokers almost always recommend a purchase, at least on the front page.